The Fire Kitchen was guest at the Arch in Genk in June 2017. 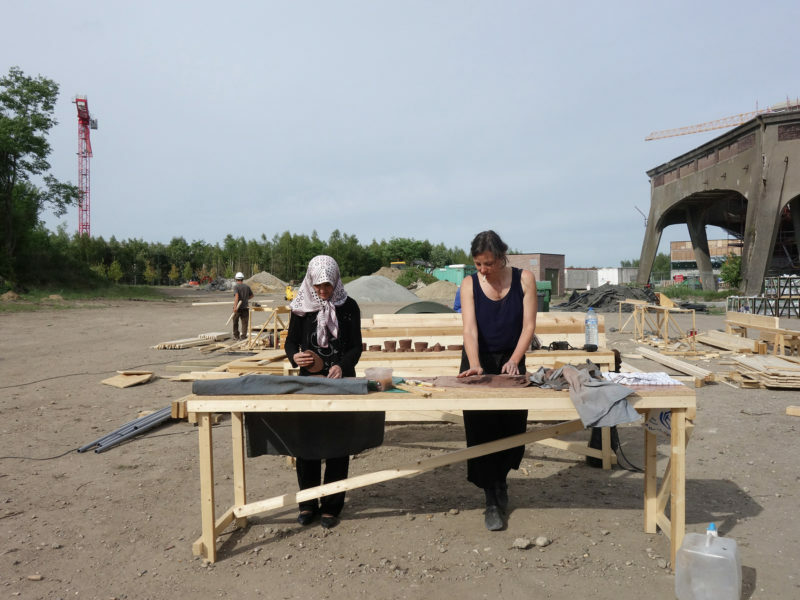 Johanna Dehio and Mascha Fehse transformed raw materials, namely vegetables and clay, into a usable kitchen unit and fully set dinner table, with the participation of interested people from the region and Vrouwencentrum Genk (women’s center). 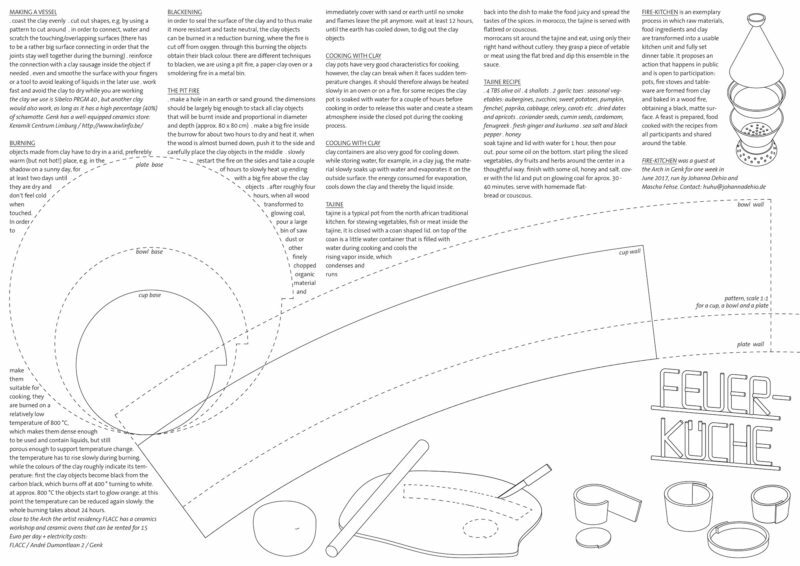 The aim of this residency was on one hand to develop an easily repeatable workflow for producing simple objects, such as a cup, a plate and a bowl, for the Arch kitchen and for the use by its inhabitants. 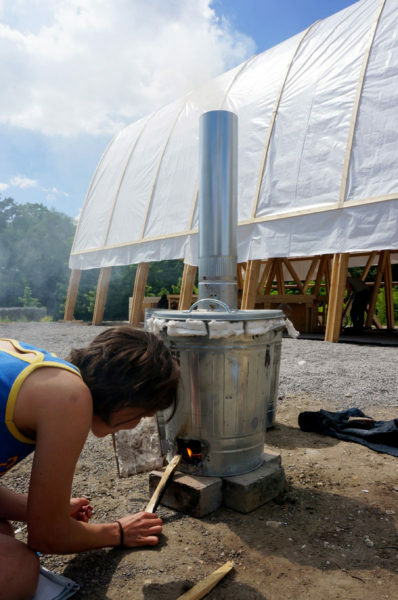 This format can be repeated during the summer to enlarge the kitchen equipment and to propose the workshop to a public, sharing the knowledge. A manual is available at the Arch. 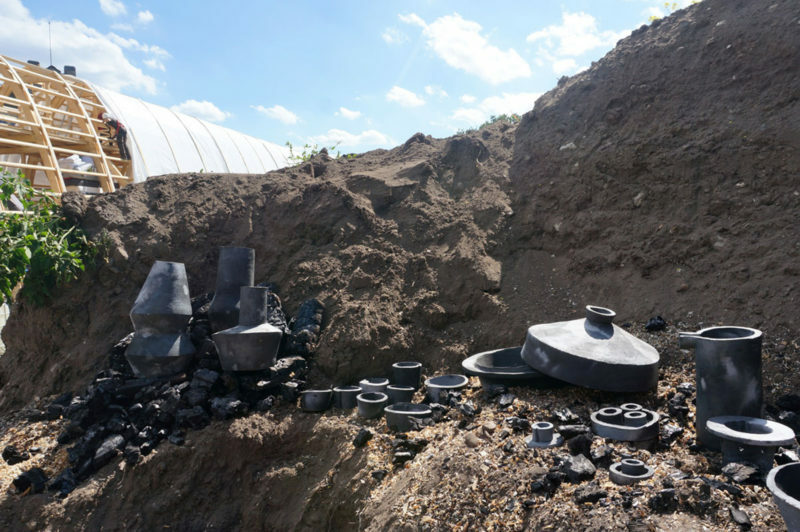 On the other hand, large cooking objects were developed and built, such as a stove, a tajine, a comal, a natural refrigerator, several jugs and large bowls. They were formed from clay next to the saws chopping wood. 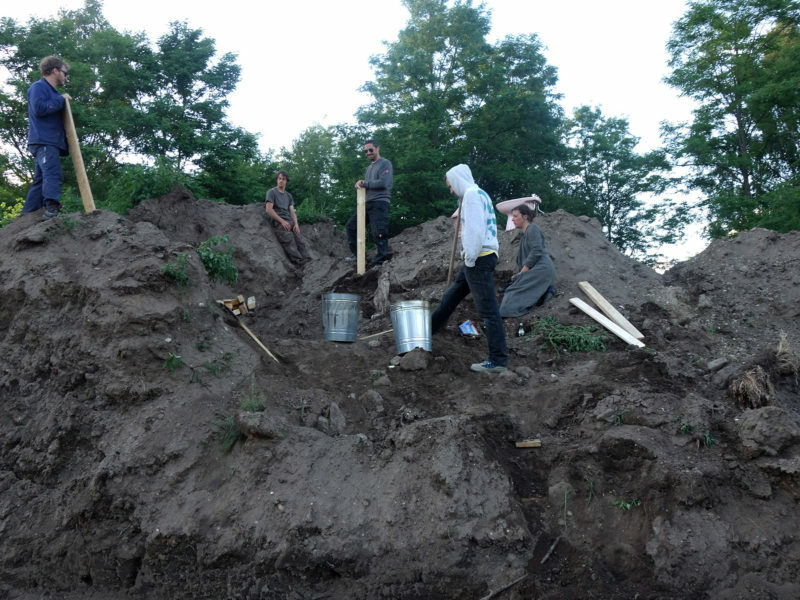 The left-overs from the wood construction were heaped up on the mountains of temporarily stored and yet to be incorporated building material to create an unreal archaic setting in a brief artificial landscape. 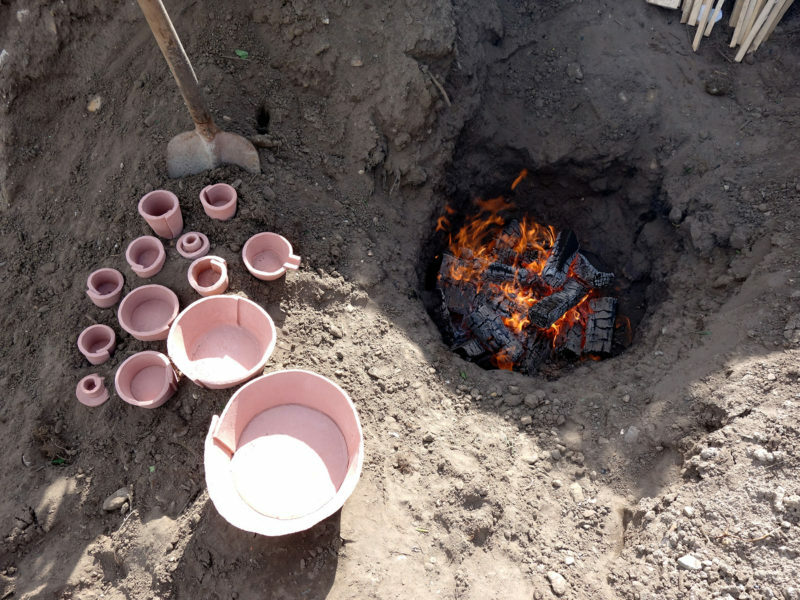 A big fire was lit in which the ceramics were baked. The landscape around a mine looks like it was painted black. 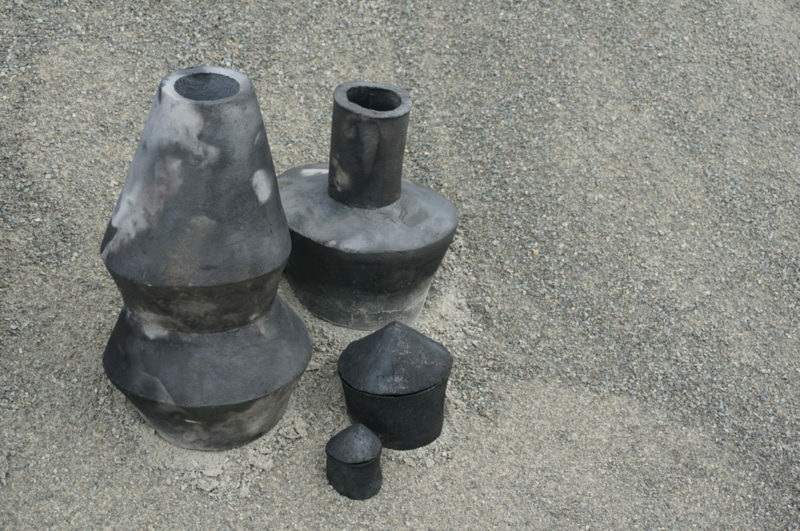 The extracted earth that the terrils are made of and that was replaced by tunnels to reach the deep reserves of stone coal resemble our clay objects that took a deep matte black colour in the reduction burning. This appearance is alien in the colourful feast of recycled plastics, collected from the neighbourhood and exhibitd at the arch, but yet relations can be traced. 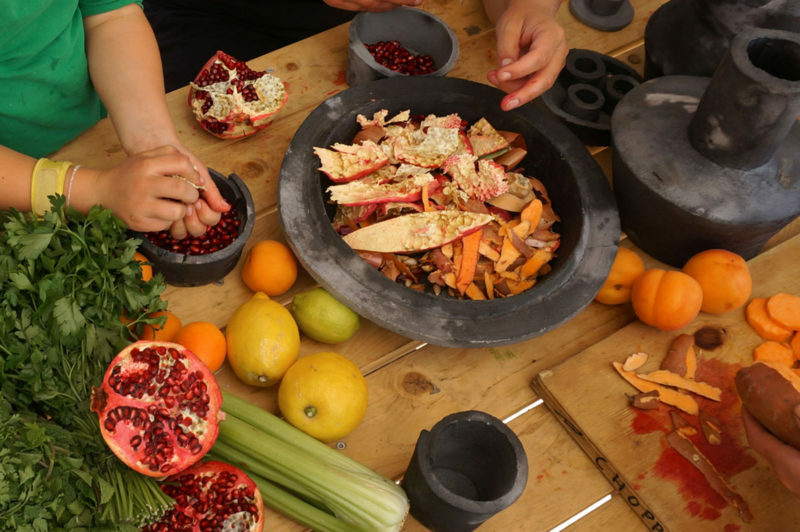 To celebrate the start of the cohabitation of these distant relatives – coal, oil, plastic, clay – a feast was prepared, food cooked and shared around the table with builders and visitors.